Murder by Gaslight: The Elmira Tragedy. Two boys playing near a bridge at Carr’s Corners outside of Elmira, New York on Sunday, January 6, 1884 found the body of a young woman frozen in the snow under the bridge. The coroner determined that the woman had been murdered, causing a sensation in the small town of Elmira, on New York State’s Southern Tier. The unidentified woman had been seen in several Elmira beer shops the previous Friday afternoon, accompanied by a young German man. She had displayed a large roll of bank notes and was wearing some distinctive jewelry—a gold watch on a slender gold chain, large old-fashioned gold bracelets, a large ring, earrings with long pendants, and a gold breastpin. Neither the money nor any of the jewelry were found on the body. No one knew the man who was with her, but those who saw him provided a fairly thorough description. He was slender, five feet, eight inches tall, with a light complexion, brown hair and had a light mustache and side whiskers. His left eyelid had a peculiar droop. From some comments he made it was suspected that he had recently been an inmate at the Elmira Reformatory. Officials at the Reformatory confirmed that a man fitting that description had been released on parole, in 1882. 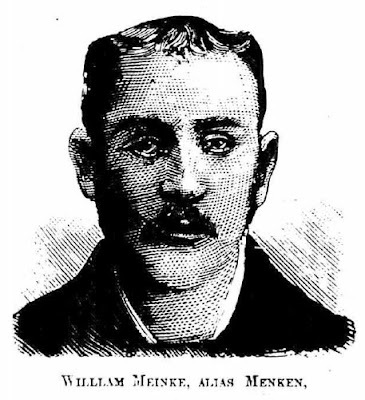 His name was William Menken (aka Meineke) who had been sent to the Reformatory after being convicted of robbery New York City. His left eye was glass. The District Attorney of Chemung County telegraphed the information on Menken and the stolen jewelry to Inspector Thomas Byrnes of the New York City Police Department, who put his detectives on the case. They identified the woman as a 23-year-old servant at a residence on Eighty-Ninth Street. Menken had taken her away on New Year’s Eve and they were to be married immediately. The spelling of her name was never fully nailed down, it was reported as Katie Bradschoff, Bradshepf, Branerhoff, Broedehoft, etc. 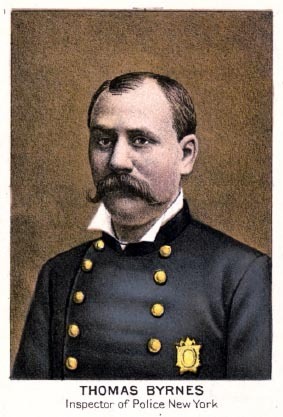 Detective-Sargent William Adams who had arrested Menken in 1879 for a robbery in the Bowery, learned that he had a sister living in Flatbush, Long Island. The police watched the house, and arrested Menken when he arrived. In his possession were $160 in banknotes, and jewelry that perfectly matched the description of the jewelry worn by the murdered girl. Menken was arrested and sent back to Elmira for trial. The citizens of Elmira extremely pleased with Inspector Byrnes’s quick solution to their mystery, and in April presented him with an elaborately framed set of resolutions expressing the town’s gratitude. When Menken was convicted of first-degree murder, later that month, and sentenced to be hanged, the matter appeared to be fully resolved. But it would not be that simple. Menken’s defense was that Katie had accidently fallen from the bridge, hit her head on a post and died. He left her there and returned to New York City because he did not think anyone would believe the story. The jury in his trial had been taken to the bridge to view area where the body was found. There was no post when they saw it. After his conviction, Menken’s attorneys were able to prove, to the satisfaction of Judge Murray, that the post had been removed between the time of the death and the time the jury saw the spot. He overturned the verdict and granted Menken a new trial. The people of Elmira were livid over the judge’s decision and took to the streets to hang Menken in effigy. The Elmira Sunday Tidings, published a scathing article condemning the judge’s action. They changed their tune and published a retraction, however, when Judge Murray sued the paper for libel. Menken was tried again the following December. The defense was granted a change of venue, and this time the trial was held in Binghamton, Broome County. Once again, Menken was convicted of first-degree murder and the defense filed an appeal. While awaiting the outcome of his appeal, Menken was held in the Binghamton jail. In early January 1885, Sheriff Brown travelled to Wellsboro, Pennsylvania, leaving the jail in the charge of two inexperienced deputies, Fred and Jacob Oskerman. Menken was housed in the south corridor, where he was the sole prisoner and had free reign of the corridor except when locked in his cell at night. The night of January 14, Menken used an age-old trick— a “threadbare and moth-eaten trick” in the words of the Police Gazette—fashioning a dummy under the covers of his bunk. He hid in an empty cell, slipping out the open corridor door when Fred Oskerman came to lock him down for the night. It was several hours before Oskerman discovered his error and aroused the town with the sound of fire bells. Menken managed to get twenty-two miles away before he was discovered in a haystack in a barn near Owego, New York. He was returned to Binghamton and kept under close watch thereafter. Though he died proclaiming his innocence, after his death Menken’s attorney produced a written document, signed by William Menken, confessing to the murder. "[Inspector Byrnes]." New York Times 9 Apr 1884. "[Menken, the murderer]." Williamsport Sun-Gazette 23 Jun 1884. "A Sensational Murder Trial.." New York Herald 2 Dec 1884. "Arrest on the Charge of Murder." Boston Journal 11 Jan 1884. Defenders and offenders. New York: Buchner & Co, 1888. "How Menken Escaped." National Police Gazette 7 Feb 1885. "Judge Murray Vindicated." New York Tribune 22 Oct 1884. "Menken Hangs." Wellsville Allegany County Democrat 8 Jul 1885. "Menken Swings." Wellsville Daily Reporter 28 Apr 1884. "Murderer Menken." Wilkes-Barre Times Leader, the Evening News 24 Jan 1885. "Murderer Supposed Captured." Cincinnati Commercial Tribune 11 Jan 1884. "Summary of the News." New York Herald 10 Dec 1884. "Suspected Of The Elmira Murder.." New York Tribune 11 Jan 1884. "The Elmira Tragedy." Cleveland Leader 11 Jan 1884. "The Murderer Menken Escapes." The New York Times 15 Jan 1885. I lived in Elmira for 12 years back in the 1980s and early 90s. I've read up on a lot of city history, but they left this story out! poor girl. he left the body,robbed it, and claimed he didn't do it, because innocent people always rob their dead loved ones! At least he was hung. nowadays he'd be given restitution for emotional anguish or some nonsense along with an exhaustive apology. Growing up in the Elmira area, our family knew of the Katie "Bradhoff" William Menken affair via a song handed down to us as children by our mother. She had learned the song from her grandmother who was contemporaneous with the late 19th events. The song's tale related the essential facts presented in the post but also included an admonishment from Katie's landlady on 89th St. that "all that glitters is not gold." Our family members still sing this song at gatherings some 50 years after first learning the "Tale of Katie Bradhoff". We shall endeavor to ensure it survives with our grandson and beyond. I have the words and know the tune. Gary Hart, How can I get them?